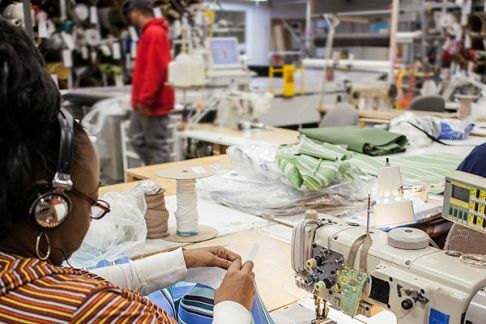 From the friendly voice on the other end of the phone to every stitch sewn to make your cushion, your order will be placed, processed and manufactured in America. For more than a decade, Cushion Source has operated under the principle that American-made quality will never be compromised. Cushion Source is custom made right. We don't sacrifice quality for speed or cost. Each order is meticulously crafted to exceed your custom home furnishings expectations. Our expert sewers have many years of experience in workrooms, sewing facilities and right here at Cushion Source. Our in-house designers are just a phone call away to help you choose fabrics for your project. We believe in old-fashioned, American-made quality, and we'd love to show you the difference by serving all of your soft home furnishings needs. Cushion Source's order processing and customer service center is based in Montgomery, AL, and we have several manufacturing facilities throughout the United States. As many manufacturing jobs have been lost in recent years to lower-priced overseas operations, Cushion Source is more committed than ever to grow production within the U.S. borders. Since our founding in 2004, every indoor and outdoor furniture cushion, every drape panel, every umbrella canopy, and every throw pillow from Cushion Source has been made in America, and that's the way it will continue to be. If you need help choosing fabric, deciding on a style or making a template, our friendly customer service staff is here to help. Our experienced, knowledgeable and friendly staff will answer your questions right away. Call us at 800-510-8325, or send us an email.